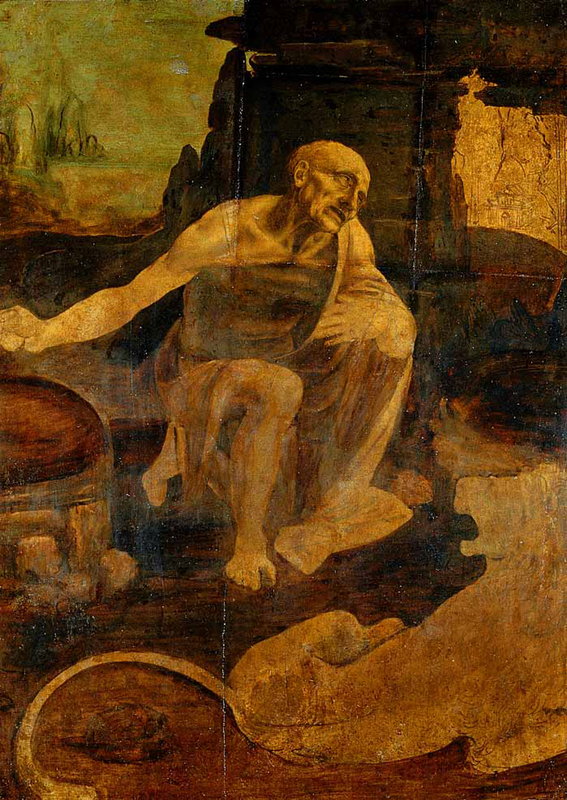 Saint Jerome in the Wilderness, Leonardo da Vinci, Vatican Museums. The mysteries revolve around the physical realities of the artworks, what was lost then found, what was there, that did not belong, and what was there and not seen. As fascinating as the solutions to the mysteries are, also of interest are the revelations of the character traits of those involved, the persistence of a cardinal, the fortitude of an old sculptor, and the conviction of an art historian. Saint Jerome in the Wilderness was in the Roman studio of the nineteenth century artist Angelika Kauffmann. She proposed that it was a Leonardo da Vinci. It is. It disappeared after her death. Joseph Cardinal Fesch, the uncle of Napoleon Bonaparte, and an art collector, found the painting of Saint Jerome in the Wilderness being used as a table top in a junk shop in Rome in 1820. The head was missing. It had been cut out of the walnut panel. The cardinal knew of the painting. Armed with hope he was determined to find the head. He searched for five years. He found it used as the top of a stool in a cobbler’s shop. Imagine his surprise seeing it when the cobbler got up to get his shoes. We don’t know if he was picking up his shoes or if the visit to the shop was part of his systematic search. We do know that he never gave up on solving the mystery to complete the masterpiece. Leonardo’s Saint Jerome is the only Leonardo in the Vatican Museums. If you are standing in front of it and you bend down the light reflects in such a way that you can see the lines around the head showing where it was cut out (also in the photo here). Leonardo spent only five years in Rome. He was a part of the birth of the Renaissance in Florence, and in this painting one can see the preeminence of drawing, a feature of Florentine art. Then, the loner, the pioneer, evolved a way of modeling form with paint with a particular softness and subtlety. It is called sfumato, from the Italian, fumo, for smoke, as in La Giaconda, the Mona Lisa, another painting on wood that he carried with him for many years. We do not yet see this in Saint Jerome because the painting is unfinished. The painting is from 1482. It is oil over tempera. It shows Leonardo’s study of anatomy. His biographers characterize him as being prone to melancholy and say that this was a difficult time. From his writing, "Codex Atlanticus", "Why do we suffer so? The greater one is the greater grows one’s capacity for suffering. I thought I was learning to live; I was only learning to die." Artists show emotion through the gesture of a figure often through the neck. From his pose we get a sense of the saint’s penitent life. Saint Jerome left Rome to live in a cave to do his life’s work, to translate the Bible into the Latin Vulgate. Sanctity can be seen and felt and so, he who sought solitude, was followed by many into the wilderness. He is often shown with the lion from whose paw he removed a thorn. At the entrance to the Vatican Museums, if you look up, you will see a sculpture over the doorway of Michelangelo and Raphael. They are the artists that define the High Renaissance in Rome. They are linked with Pope Julius II and the Vatican Museums and the palaces. Da Vinci was older and interacted with and influenced the two younger artists. The connections between the three great artists are deep and complex. In relation to Rome, Leonardo was the lone traveler, Michelangelo, the sculptor with a workshop in the city who spent most of his life there from 1496 to his death in 1564, and Raphael was the star artist in residence for popes and princes. Lady with a Unicorn, Raphael, Galleria Borghese. Across the river, on the other side of the city, is a Raphael painting influenced by Leonardo’s Mona Lisa. Raphael was the great imitator. If you walk through the Pinacoteca of the Vatican Museums you see paintings by Perugino, (the guy from Perugia), Raphael’s teacher. Then you enter the Raphael Room which is just before the room with Saint Jerome. You can see that Raphael out Peruginoed his master. Then he assimilated what Leonardo had to teach. Later, as he was frescoing Pope Julius’ apartments, Bramante, the architect of Saint Peters Basilica, snuck him into the Sistine Chapel to see Michelangelo’s ceiling. The younger Raphael’s art would never be the same after he saw the sculptor create solid figures in space with paint. There was something not right about this painting of a woman. The shoulders and torso were covered with heavy drapery that did not match the delicacy of the head. This inconsistency and mystery was solved when the great art historian Roberto Longhi first, in 1934, authenticated the painting as a Raphael, then, he said the cloth must go. His stature was such that he was obeyed. The painting was restored and the unicorn was revealed. Many art historians are adept at research and may be able to explain art but to trust one’s eyes as Longhi did is rare. He was also responsible for rediscovering for the modern world Michelangelo Merisi di Caravaggio and he organized an exhibit of his paintings in Milan in 1951. Michelangelo was working on the Pieta Rondanini six days before he died at age almost eighty nine. It was in his studio and then in the Rondanini Palace in Rome. The mystery is the large arm attached only by a tab of marble. Many bizarre speculations have been written about it why the arm is there. I wanted to know why. I knew that I had to see the back of the sculpture. When I taught some Drawing classes at Harvard University I used to have long conversations with one of the most renowned Michelangelo scholars in the world. He told me that he had to see the back of the marble Moses in the church of San Pietro in Vincoli in Rome. He went over the ropes and was grabbed by the guards. With his distinguished looks and perfect Italian he was released right away. I was determined to "go over the ropes". I went to Milan in 2005 to see the Rondanini. There was no need to go over the ropes. The sculpture was in the middle of the room, not in a niche as it had been for so long. The struggles of the sculptor with this piece are extensive. The polished legs are from an early version. On the top of the Madonna’s head there is another face from when she was looking in a different direction. The Rome Pieta that the sculptor carved when he was twenty five is polished all over. All of the tools and refinements of marble carving were used as never before. But here, Like Rembrandt, the old man, who used only the big brush, and the old Titian who did the same, and used his fingers, the old sculptor reverted to the most basic tool, the point chisel. He attacked the marble to create form with no regard to finish. It is very moving because he was running out of marble. He was forced to carve the head of Christ out of the Virgin’s shoulder. This Pieta has the same pathos and spiritual power of the most famous one from his youth but at this point he is less concerned with matter. The sculpture soars in one upward movement. He said that he was most himself when he was carving.